As Benjamin Franklin famously said the only certainty is death and taxes. 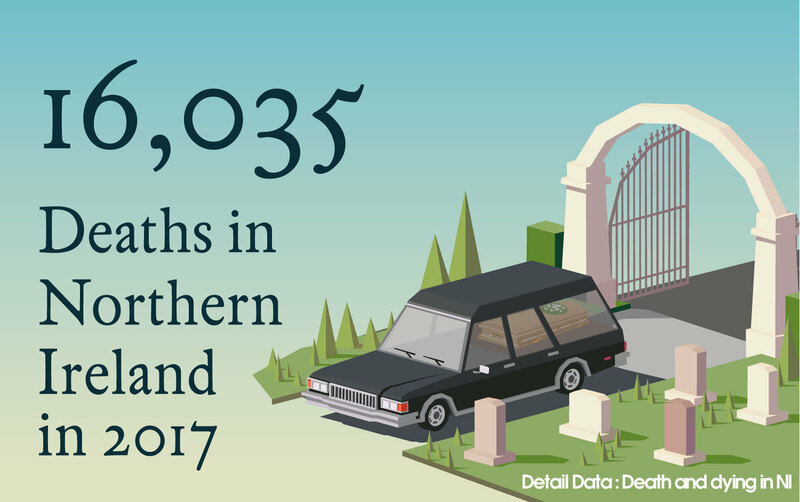 And with 16,035 deaths in Northern Ireland in 2017, funerals are big business. With a basic funeral in Northern Ireland costing around £3,000 but many people choosing to pay closer to £9,000 it is a significant expense for grieving families. For that reason, Citizens Advice Northern Ireland would like to see more regulation of the funeral industry, especially on financial checks and affordability. “You may be lumbered with an £8,000 funeral cost, however you have no way of paying for that,” explained Sarah McCully Russell, Citizen Advice NI’s information and policy officer. There are also concerns that because people in Northern Ireland traditionally get buried within two or three days of death compared to more than a week in England that grieving loved ones are being forced into quick decisions. “In Northern Ireland we traditionally bury our family members quickly, within three days, so you are often making financial decisions when you don’t know what support is going to be available,” she continued. The National Association of Funeral Directors (NAFD) which has 84 funeral homes as members in Northern Ireland, representing over 85% of the industry here, has seen the same culture. “There is still a very highly held moral, ethical and social feeling, or code, within society to ensure that funeral costs are paid for as soon as possible by the family,” explained Gary Haire, NAFD’s Northern Ireland president. He admits that the speed at which people are buried here presents a greater risk of non-payment for funeral directors. However, NAFD was unable to provide any figures for the amount of debt being carried by funeral directors in Northern Ireland. We also asked Co-op, the largest operator in Northern Ireland with 20 funeral homes, about the levels of debt but a spokeswoman said they couldn’t share the business data. But a search of Companies House data provides some insight into the funeral industry here. The latest financial statement for Funeral Services Northern Ireland Limited, which is a subsidiary of Co-op, shows the company made a pre-tax profit of more than £2million to the end of December 2016. It also reveals that more than £95,000 in bad debt was outstanding after six months – the majority of that (£57,000) was outstanding after a year. When we asked Co-op Funeralcare about its charging policy it said: “Customers pay for any disbursements (e.g. cremation charges, burial costs, doctors’ fees) when they arrange the funeral. For everything else we send an invoice about seven days after the funeral. The National Association of Funeral Directors (NAFD) said: “Some funeral directors ask for significant disbursements to be paid up front. Companies would normally issue an invoice between 14-21 days after the funeral and then expect payment within the next 30 day period. However, a number of firms will also enter into an agreement with families to enable them to pay the account over a 12-24 month period. NAFD also requires their members to publicly publish their prices and provide clients with a price list and written estimate. Twenty-seven funeral directors in Northern Ireland, including Co-op have signed up to the Fair Funerals pledge to tackle funeral affordability. A Co-op spokeswoman said: “The enhanced Fair Funerals Pledge requires funeral directors to help people find funerals within their budget by displaying the full price of affordable options both online and in their funeral homes. The pledge also calls for prices displayed to include average third party costs such as burial and cremation fees, a key component of overall funeral costs. The Fair Funerals Pledge is part of a national campaign by Quaker Social Action to tackle funeral poverty. Another issue which Fair Funerals has been lobbying on is child funerals. Many families do not even contemplate the death of a child but to the year ending September 2017, in Northern Ireland there were 239 families grieving the loss of a child under 14 including 95 as the result of a stillbirth. Co-op Funeralcare has a policy to support bereaved parents dealing with the death of a child up to the age of 18. It means that Co-op does not charge for its funeral director services. CEO of Co-op Funeralcare Richard Lancaster said: “Dealing with the death of a child is a devastating experience for any parent and having to comprehend this as well as sorting out the funeral and associated costs makes this experience even more traumatic. Our Freedom of Information requests to the 11 councils also revealed inconsistencies in child burial policy. Some make no charge for opening a grave for the burial of a child and others discount – traditionally about 50% less than the cost of opening a grave for an adult burial. But the reduced grave opening fees depend on the age of the child being buried. 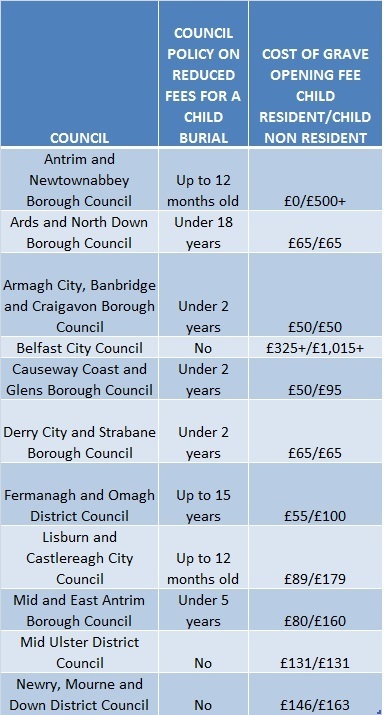 Just one council offers a discounted rate until the age of 18 – Ards and North Down Borough Council. The other councils define a child as up to the age of 12 months, two years, five years and 15 years. Three councils charge full cost. However, the majority of councils charge full cost for the purchase of a grave for a child. Considering even just the opening fee for a grave for a child burial – the prices charged by the 11 councils range from £0 to more than £1,300 depending on whether it is a first or second opening. Belfast City Council charges less for the cremation of a child than an adult - £160 for a resident and £305 for a non resident child.